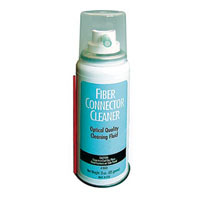 AFL Telecommunications is pleased to announce our new Fiber Optic Cleaning solution. A non-flammable, environmentally safe, residue free solvent engineered to clean fiber connector end-faces. This product is exclusively produced for Noyes Fiber Systems by Micro Care Corporation, a world leader in cleaning solvents. - Electrically conductive, it neutralizes "Particle Cling"